If we abandon that other inadequate phrase discussed in the last post in favour of something better, what better phrase should we choose? I compiled a list from a select group of contributors, who’s names shall remain a secret, lets just call them Paul, Charles, James and Jeff for now. I will list each contribution, comment and rate it on three crucial qualities, and render my verdict. The three criteria for ranking are A. Alliteration — is it fun to say this phrase, does it sound poetic? B. Accuracy — how well does it capture or describe the experience? 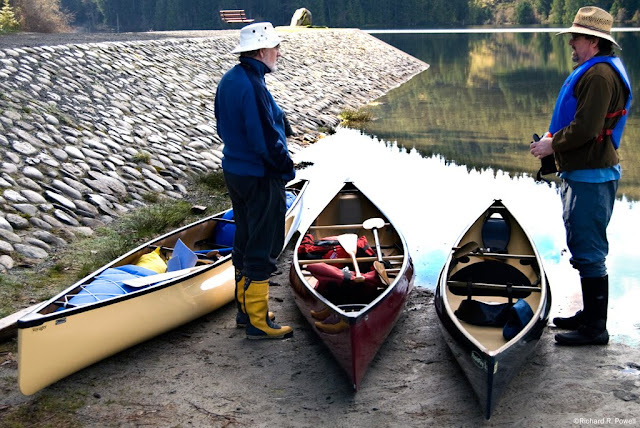 C. Vernacular — how likely will the phrase be adopted by other paddlers? 3 is high, 2 is average, 1 is low, 0 it doesn’t even qualify. Alliteration — 2 — Three strong syllables with a side click tapering to a soft “ing.” Sounds ok, but nothing special. Accuracy — 2 — Fairly accurate, though backwater has a slightly ambiguous meaning, sometimes carrying a negative connotation similar to Hicksville or boonies. Vernacular — 1 — Description but not very inspiring or endearing. Alliteration — 1 — While investigating is an accurate description of what a person does who appreciates these locals, the word itself is 5 very distinct syllables, slowing the word down too much and making it heavy. Accuracy — 2 — Not inclusive enough. The golden zone we seek is not just in bays. Vernacular — 1 — Sounds too much like a job for Columbo. Alliteration — 3 — Great alliteration, I have to admit. Accuracy — 1 — Bogs unfortunately are not as accessible as fens for the average paddler but some “bog-like” corners of lakes might qualify. 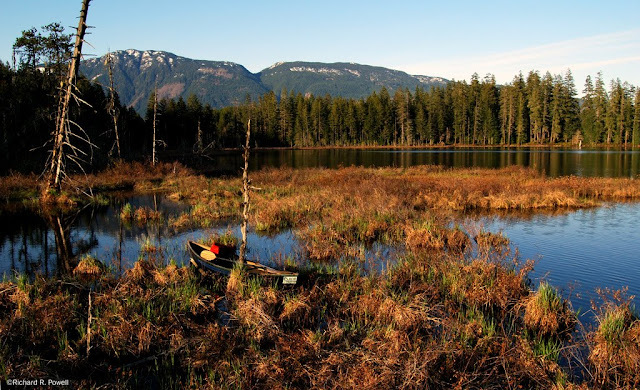 Unfortunately the technical definition of a bog includes the isolation from sources of fresh water; a bog depending almost exclusively on rain and snow fall. And not all places of interested are bog-like. Vernacular — 2 — I can see this one catching on because of the humorous if slightly bawdy connotation, but in the end that might not be the quality we ultimately want to sit in our minds. Alliteration — 2 — There is a nice ring in collecting, but calm has a soft sound. Accuracy — 1 — This phrase has the danger of sounding like some new age “hunter gatherer” activity. Nothing indicates paddling or a location in which the collecting is done. Vernacular —1 —I doubt this would catch on. Alliteration — 3 — A great rhyming couplet. Accuracy — 2 — There are ducks, but we don’t muck them, and we do muck a bit, but not like ducks. Ok, a little bit like ducks. Vernacular —1 — Unfortunately it sounds like something ducks do, or something you do to ducks. Alliteration — 2 — Not bad but the “en” sound is inherently weak. Accuracy — 3 — A fen is a mineral rich wetland usually dominated by sedges and calcium loving herbs and shrubs and is characterized by the accumulation of peat. In hard water areas fens are often accessible from nearby lakes and streams. Fens are often the pre-cursor to swamps and bogs. They are distinguished from bogs by the influx of water from sources other than snow and rain. 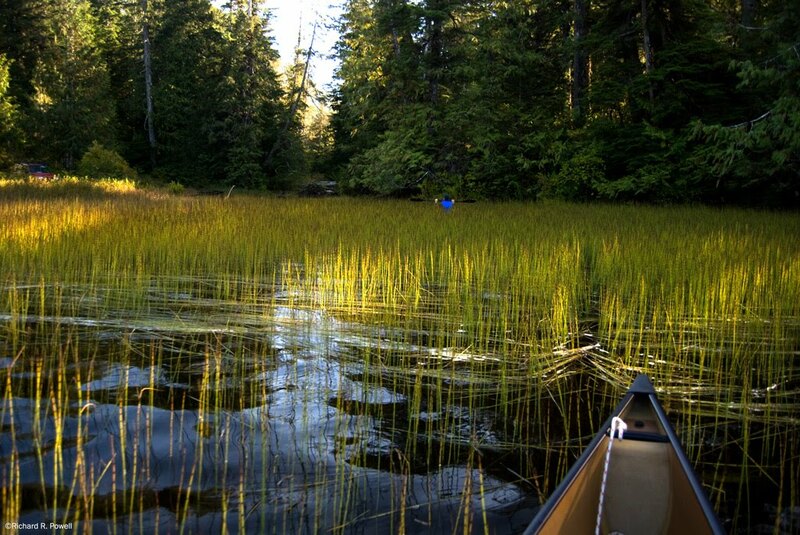 Swamps are kind of like fens with trees, and so a fen and a swamp can be hard to tell apart. Vernacular —2 — Sad as it may seem, very few people know what a fen is, so there would be an educational component to using this phrase. Alliteration — 3 — There is a nice onomatopoeia to this couplet. Accuracy — 3 — Liminal is from the root Latin word limin, which refers to a threshold and this traditionally descriptive word is more and more used allegorically for a state of mind characterized by ambiguity, openness, and indeterminacy. One's sense of identity dissolves to some extent when in a liminal state, and there is a sense of crossing over to an altered way of seeing. More concretely (and traditionally) a liminal space can be any blurry boundary zone between two established and clear spatial areas. Both definitions seem to capture the essential quality of cruising along a weed bed on the margin of a lake. Vernacular — 2 — Liminal, confused sometimes with luminal, was tarnished in past decades by hippie new agers, but it is so apropos that it is tempting to try and jump start it’s use in the vocabulary again. Alliteration —2 — Nothing special here but nice enough. Accuracy —3 — Well, of course littoral means, of or existing on a shore and is from the Latin for “stem” presumably in reference to those plants growing on or near the shoreline. We call them reeds. Vernacular —2 — Could be confused with litter, or literal, which might not be a bad thing, but might not be a good thing either. Alliteration — 2 — There are some nice sounds in this couplet, the long ee in reed followed by the sharp ip in clipping, but somehow the clipping seems to trip the tongue. Accuracy — 2 — While technically there is a fair bit of reed clipping (in the sense of “I just brushed harshly against that reed” in the shallow water exploration process) it conjures up both harvesting images and also sailing images. Vernacular — 2 — I just don’t see this one catching on. Alliteration — 2 — Fairly good alliteration but not as good as others in the list. Accuracy — 0 — Well, in a metaphorical sense, yes, but you would have to be a very tiny person to really hug a rush easily. I’ve heard of people hugging a grudge, but not hugging a rush. The image problems seem insurmountable. Vernacular — 0 — The “tree hugger” connotation along with a certain smarmy feel, just boots this one right out of the pond. Alliteration — 3 — A nice slow roll on the tongue echoes the slowness of the activity. Accuracy —3 — Extremely accurate as bending sedges is almost impossible not to do if you really get into it — so to speak. Vernacular — 3 — Seems to have a natural infectious feel despite the possible negative connotations of going on a bender. Alliteration — 2 — The slow quality is good, but number of syllables, rather than their consonant/vowel blending creates the slowness, so it is not as strong a couplet as others. Accuracy — 1 — Can you inspect Serenity? Perhaps, but if so, it is an inner inspection and while the concept is kind of nice, it is not specific to paddling. Vernacular — 1 Hard to say, but my sense is that serenity or even tranquility loses out to other more concrete image based couplets. The phrase seems shifted away from the direct experience into interpretive language. Alliteration —2 — Ok, but nothing special. Accuracy — 2 — generally accurate, in the sense that when paddling the littoral zone one must paddle more carefully and with less depth, and one “dips” into bays and shallow areas to take a look, but it doesn’t really capture the magic of the moment. Vernacular — 1 — Is it Shallows or Shallow, the confusion is bound to arise and so it is unlikely to catch on. Alliteration — 1 — Unfortunately this couplet actually catches on the tongue. Accuracy — 2 — The word blading just seems to conjure up the wrong image somehow and paddling is accurate but suffers from an association with childhood wading or duck behaviour. Vernacular — 1 — Shallowwater and blading are both not already in the vernacular – I don’t think it will fly. “Shallow water paddling” is a good description of what occurs, but really does not create any spark, or inspire any devotion. Alliteration — 3 — Strong sounds with a unique stab at the beginning and a running out towards the end. Accuracy — 2 — It happens. Vernacular — 2 — OK, I can see this one catching on, because it sounds like another kind of disturbing, but seriously folks, is that the image we want to evoke with this phrase? So, five phrases stand out, with Sedge Bending being the winner. Sedge Bending – 9 THE WINNER!